What do you give someone who has everything? How about their own century? In David Douglas Duncan's case that would be the 20th century. The revered photojournalist is such a generous soul, though, that he shares it with you in what he predicts will be his last book, My 20th Century. Having turned 99 in January, Duncan may not be kidding. In fact, the book begins with the story of how, carrying his dog Duzi, he tripped over a lamp cord, fell and broke his hip. During the ensuing hospital stay, he revisits his career. And that's the book in a nutshell. It jumps around a good bit, like any sedative-induced hallucination. And for those wondering if you can dream in color, the answer is, apparently, yes. There are 30 color photos and 73 black and white images in the book. Duncan was born in 1916 in Kansas City, Mo. As an amateur photographer in the 1930s he accidentally shot John Dillinger, the bank robber. That is he shot a photo of him returning repeatedly to a burning building to try to rescue his suitcase. Not, it seems, for the clothes. That was his Duncan's break -- even though the negatives were lost by the Tucson Citizen before the image was ever printed. As a Marine Corps combat photographer in 1943, Duncan took some of the most memorable photographs of World War II, the Korean War and the Vietnam War before joining Life magazine to travel the world, shooting in Iran, Turkey, Morocco, Saudi Arabia and Russia. In 1956, he met Pablo Picasso and began a friendship that would produce uniquely personal images of the artist and his work, including a portrait in the bathtub. The book's highlight is a set of those images, a few of which show Picasso's affection for Duncan's dog Lump. He tells us in the beginning that he used a Nikon Coolpix S620 to document Duzi's life. He picked the camera up when he was shopping for a replacement for his fax machine. The first images of the book are color photos taken with that digicam. The rest were shot with a Leica (including silent models made just for him) to which he attached Nikkor lenses. As an amateur photographer in the 1930s he accidentally shot John Dillinger, the bank robber. That combination gave him an advantage over his colleagues. The Leicas were smaller than the gear other photojournalists used in conflict zones and the Nikkor lenses produced a quality that rivaled larger format cameras that weren't very well suited to battle. But our favorite image in the book was shot with a second-hand Kodak folding camera in 1936. "My first attempt beyond snapshots," he captioned it. Called Grandmother Granddaughter, it shows a girl guiding the hands of an old woman threading a needle. The head of the girl, who is close to the camera, is softly blurred, the eye of the needle sharp, the old woman's face turned down to concentrate on the job at hand. A lovely shot. And to think that girl herself would be a grandmother now. Duncan, we understand, designed the book himself. It's one of our few complaints about the thing. There isn't a lot of text but it's hard to read. The line length is too long and runs into the gutter. It looks more like a Word document than a book. But there's only a few pages of text (although you'll miss some fun if you don't read the flaps of the dust jacket). The photos are captioned as if Duncan is sitting right there with you, telling you about them. In some cases, he leans in a bit heavily, the captions overlaid on the image. In others, he wanders off with some reference clear to him but not to you. But, you say, that's part of the charm of the thing. Image quality is just a bit uneven but it isn't the reproduction quality so much as the variation in technology of 80 years. Most of the reproductions do the images justice, but a few images just don't reproduce well. Mainly the Coolpix JPEGs. But there are also some less than successful exposures like the group of images taken in Picasso's garden that are just a muddle. You can't tell the dog from the statues from the foliage. There's a large selection of the war images for which he is justly famous, including "the first photographs of jets in warfare." While he's revered for his Korean War photos, we found the Vietnam images most striking. The troops simply seemed younger in that war. His archive has been housed at the University of Texas at Austin since 1996. The gallery of 600 images contains many (if not quite all) of the images from the book. You could spend your time looking those over but then you'd miss the running commentary of a man recovering from a broken hip who has a lot to say about his century. 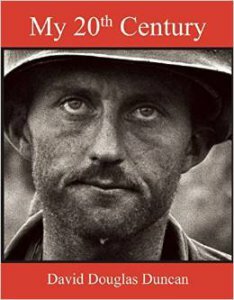 My 20th Century by David Douglas Duncan, published by Arcade Publishing, 144 pages, $24.99 (or $18.62 at amazon.com).